Compiled and published by Kreutz Creek Center for Language, Culture & Other Pastimes. Butch Reigart, translator and editor. Pennsylfaanische Deitsche "Gschichde un Gschpichde" vum Johnnie Brendel vun die Reinholds. 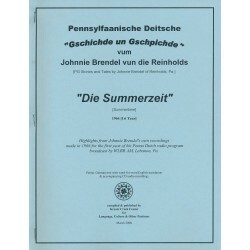 (Pennsylvania German Stories and Tales by Johnnie Brendel of Reinholds, Pa.) Highlights generally relating to summer from Johnnie Brendel's own recordings made in 1966 for the first year of his Pennsylvania Dutch radio program broadcast by WLBR AM, Lebanon, PA. Pennsylvania German text with between-the-lines English translation and accompanying CD audio recordings of Johnnie Brendel. 44 pages. Handmade pamphlet. Butch Reigart, translator and editor. This booklet provides an excellent resource for intermediate-level students. The combined audio & printed materials are especially designed to improve one's listening comprehension of native speakers in conversation. Includes audio recordings of a native speaker speaking at an intermediate pace and an accompanying full transcript in PG dialect with interlinear English translation. 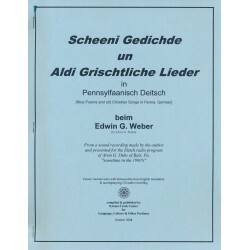 Poems and songs recorded by Edwin G. Weber and given to Alvin G. Dubs in the 1980s. 37 pages with 1 audio CD. Handmade pamphlet. Butch Reigart, translator and editor. Pennsylfaanische Deitsche "Gschichde un Gschpichde" vum Johnnie Brendel vun die Reinholds. 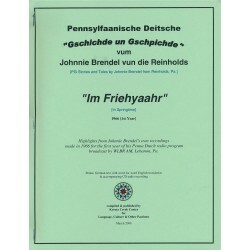 (Pennsylvania German Stories and Tales by Johnnie Brendel of Reinholds, Pa.) Highlights generally relating to spring from Johnnie Brendel's own recordings made in 1966 for the first year of his Pennsylvania Dutch radio program broadcast by WLBR AM, Lebanon, PA. Pennsylvania German text with between-the-lines English translation and accompanying CD audio recordings of Johnnie Brendel. 51 pages. Handmade pamphlet. Butch Reigart, translator and editor. Deitsche Schtories vum Harry Lauer. 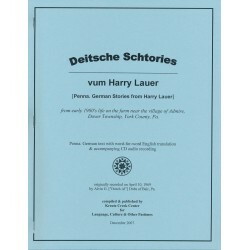 (Pennsylvania German Stories from Harry Lauer.) A series of stories told by Harry Lauer in Pennsylvania Dutch about life on a farm near the village of Admire, Dover Township, York County, Pennsylvania. 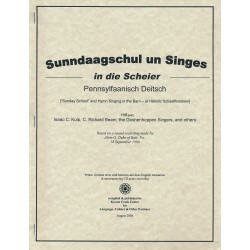 Pennsylvania German text with between-the-lines English translation and accompanying CD audio recordings. 22 pages. Handmade 8"x11" booklet bound with heavy-duty staples. Butch Reigart, translator and editor. A Pennsylvania German conversation with Jessie Stambaugh at his home in Pigeon Hills (Jackson Twp.) of southwest York County, Pennsylvania about "this, that & everything else." 34 pages with 1 audio CD. Handmade 8"x11" booklet bound with heavy-duty staples. Butch Reigart, translator and editor. Sunday school and singing in the barn - at Historic Schaefferstown, with Isaac C. Kulp, C. Richard Beam, the Goshenhoppen Singers, and others. Set of audio recordings and transcriptions thereof with between-the-lines translations from a program held at Historic Schaefferstown in 1980. Segments include Pennsylvania High German hymns and scripture readings and Pennsylvania German revival songs and scripture readings, among others. 21 pages with 1 audio CD. Handmade 8"x11" booklet bound with heavy-duty staples. Butch Reigart, translator and editor. 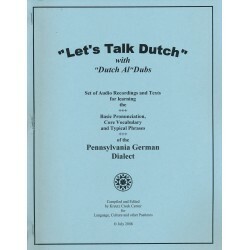 Set of audio recordings and texts for learning the basic pronunciation, core vocabulary, and typical phrases of the Pennsylvania German dialect. An indispensable guide for those learning the dialect. 32 pages with 4 audio CDs. Handmade 8"x11" booklet bound with heavy-duty staples. Butch Reigart, translator and editor. This booklet provides an excellent resource for beginner-level students. The combined audio & printed materials are especially designed to improve one's listening comprehension of native speakers in conversation. Includes audio recordings of a native speaker speaking at a slow pace and an accompanying full transcript in PG dialect with interlinear English translation. Pennsylfaanische Deitsche Schtories, Gedichde un Singschticker fer die Grischtdaag. 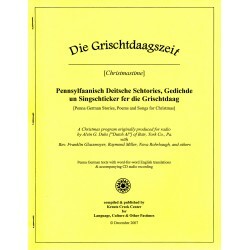 (Pennsylvania German Stories, Poems and Songs for Christmas.) A Christmas program originally produced for radio by Alvin G. Dubs ("Dutch Al") of Bair, York Co., PA with Rev. Franklin Glassmoyer, Raymond Miller, Nova Rohrbaugh, et al. 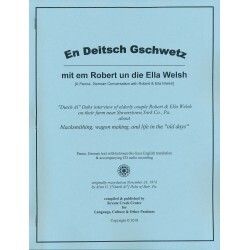 Pennsylvania German text with between-the-lines English translation and accompanying CD audio recordings. 27 pages. Handmade 8"x11" booklet bound with heavy-duty staples. Butch Reigart, translator and editor. Pennsylfaanische Deitsche "Gschichde un Gschpichde" vum Johnnie Brendel vun die Reinholds. 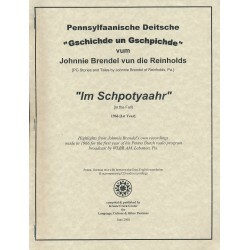 (Pennsylvania German Stories and Tales by Johnnie Brendel of Reinholds, Pa.) Highlights generally relating to fall from Johnnie Brendel's own recordings made in 1966-1967 for the first year of his Pennsylvania Dutch radio program broadcast by WLBR AM, Lebanon, PA. Pennsylvania German text with between-the-lines English translation and accompanying CD audio recordings of Johnnie Brendel. 64 pages. Handmade 8"x11" booklet bound with heavy-duty staples. Butch Reigart, translator and editor. Pennsylfaanische Deitsche "Gschichde un Gschpichde" vum Johnnie Brendel vun die Reinholds. 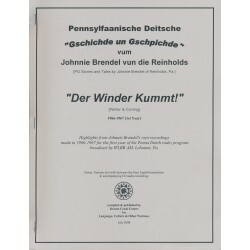 (Pennsylvania German Stories and Tales by Johnnie Brendel of Reinholds, Pa.) Highlights generally relating to winter from Johnnie Brendel's own recordings made in 1966-1967 for the first year of his Pennsylvania Dutch radio program broadcast by WLBR AM, Lebanon, PA. Pennsylvania German text with between-the-lines English translation and accompanying CD audio recordings of Johnnie Brendel. 79 pages. Handmade 8"x11" booklet bound with heavy-duty staples. Butch Reigart, translator and editor. A Pennsylvania German conversation with Robert and Ella Welsh on their farm near Stoverstown, York Co., Pennsylvania about blacksmithing, wagon making, and life in the "old days." 38 pages with 1 audio CD. Handmade 8"x11" booklet bound with heavy-duty staples. Butch Reigart, translator and editor. Edwin R. Danner tells 77 jokes in Pennsylvania German in an evening of Dutch humor at the old schoolhouse in Jefferson, PA. An additional 123 jokes in Pennsylvania German are presented in text only. 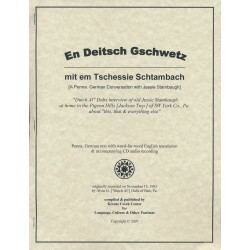 Pennsylvania German text of the 200 jokes with between-the-lines English translation of the first 77 and accompanying CD audio recordings of Edwin R. Danner telling the first 77 jokes. 28 pages with a 4-page word list appendix. Handmade pamphlet. Butch Reigart, translator and editor. 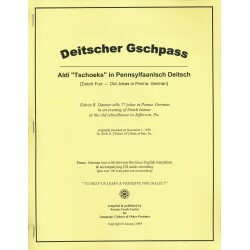 Set of audio recordings and texts for learning the basic pronunciation, core vocabulary, and typical phrases of the Pennsylvania German dialect. An indispensable guide for those learning the dialect. This digital download is provided as a 32-page PDF and four zip files of MP3 files (corresponding to 4 audio CDs). Butch Reigart, translator and editor. This booklet provides an excellent resource for beginner-level students. The combined audio & text materials are especially designed to improve one's listening comprehension of native speakers in conversation. Includes audio recordings of a native speaker speaking at a slow pace and an accompanying full transcript in PG dialect with interlinear English translation.